Outlined in our Signature Stats Glossary, pass-blocking efficiency is the measure in which an offensive lineman allows pressures on a per-snap basis, with weighting towards sacks allowed. With our added context into how we grade offensive lineman, here are the league’s top five O-Linemen at each offensive line position, ranked by their pass-blocking efficiency from 2017. Slotted as the No. 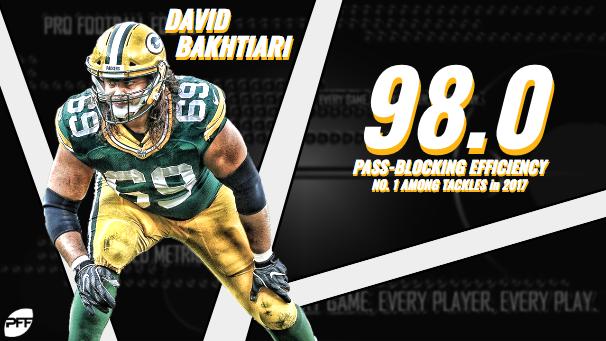 33 overall player entering the 2018 season on our annual top 50 players list, Packers left tackle Bakhtiari is held in high regard as one of the league’s best blindside protectors, and he’s got the numbers to back up such praise. Bakhtiari, despite missing four games with a hamstring injury last season, finished as the top-ranked offensive tackle in pass-blocking efficiency (98.0) among qualifiers. In fact, Bakhtiari’s 98.0 mark ranks ninth in the PFF era (2006-present) among offensive tackles with at least 150 pass-block snaps in a single season. To his credit, Bakhtiari’s 2017 efforts were no flash in the pan. Among the 144 offensive tackles with at least 1,000 pass-block snaps from 2006-17, Bakhtiari ranks sixth in pass-blocking efficiency at 96.6. Only some of the league’s best to ever play the position (i.e. Damien Woody, Joe Thomas, Walter Jones) rank ahead of him on the list. Shelved with a torn ACL and MCL just seven weeks into the season, Peters may have not made any on-field contributions in the latter half of the team’s Super Bowl run, but his efforts at the start were outstanding. Peters allowed just seven total pressures (six hurries, one sack) protecting the then-healthy Carson Wentz across 237 pass-blocking snaps, which was good for the second-ranked pass-blocking efficiency (97.7) in 2017. Adding to his impressive seven-game stint, Peters was at his best against two of the league’s star pass-rushers in Los Angeles Chargers’ Melvin Ingram and Joey Bosa. Peters held the Bolts’ dynamic duo to zero total pressures across 24 snaps in pass protection (12 Bosa; 12 Ingram) en route to a season-high 86.3 overall game grade. He also allowed zero pressures in his other eight pass-block snaps to finish the contest with a perfect 100.0 pass-blocking efficiency. The return of Peters likely can’t come sooner for Wentz & Co., as his replacement, two-year veteran Halapoulivaati Vaitai, struggled significantly in pass protection. Including the postseason, Vaitai allowed 51 total pressures in 455 pass-block snaps, leading to a 93.1 pass-blocking efficiency. Bucs tackle Dotson, a 10-year NFL veteran and former undrafted free agent, put together a career year from a pass protection standpoint in 2017, allowing just 14 total pressures across 455 pass-blocking snaps before going down with a torn meniscus in Week 12. Dotson’s career-high 97.6 pass-blocking efficiency ranked third this past season. Recovering from offseason knee surgery, Dotson won’t return to the Bucs’ starting lineup until training camp, but even if rehab all goes according to plan, the 32-year-old veteran will have his hands full proving 2017 was not a career anomaly. He recorded a sub-95.0 pass blocking efficiency in each of the four seasons he’s logged at least 200 pass-block snaps prior to 2017. A four-game suspension and several injuries limited Pittsburgh Steelers’ Marcus Gilbert for most of the 2017 season, as he played just 397 offensive snaps in seven regular season games. However, the 29-year-old Gilbert did his best with his sporadic opportunities, recording a 97.5 pass-blocking efficiency across 217 pass-blocking snaps. Now three years into his five-year, $30.8 million deal, Gilbert has earned his keep as Pittsburgh’s starting right tackle, earning 79.2-plus overall grades in all three seasons. He also played north of 1,000 offensive snaps in each of the two seasons prior to last season. He’ll assume his starting role at right tackle in 2018 with his replacement Chris Hubbard signing a five-year, $36.5 million contract with the Cleveland Browns this offseason. As long as he’s healthy and off the NFL’s naughty list, he should continue to perform at a high-level in pass protection like he’s shown capable of doing. Johnson performed at similar level to the aforementioned Peters prior to and long after his highly-regarded teammate went down with injury. He allowed just 25 total pressures across 553 pass-blocking snaps and recorded a 97.2 pass-blocking efficiency during the regular season. Johnson didn’t let up in the Eagles’ three postseason games, either. The five-year pro allowed just five total pressures (four hurries, one hit) in his 109 pass-block snaps to rank fourth in pass-blocking efficiency (96.6) among the 13 offensive tackles with 70-plus pass-block snaps in the postseason. Though he has played almost exclusively at right tackle in his career, Johnson may be the next man in line at left tackle when Peters does eventually decide to hang up the cleats. If Johnson’s pass protection doesn’t falter with the changing of the guard, Wentz can rest assured he’ll have high-end blindside protection for the long-term future. 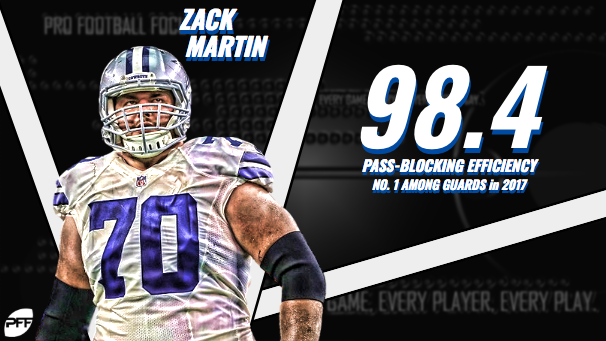 Martin has been a star offensive guard since first stepping foot in the league, earning 85.9-plus overall grades in each of his first three seasons of league. In 2017, just when you thought he couldn’t get better, he did. Martin earned a career-high 92.2 overall grade – which also led all qualifying guards – and recorded the top-ranked pass-blocking efficiency (98.4) at the position this past season. He allowed just 11 total pressures (nine hurries, one hit, one sack) across his 531 pass-blocking snaps. The product of his four-year consistency and career-year in 2017, Martin signed a six-year contract extension that will make him “the highest-paid guard with the largest guarantee at his position in NFL history,” per NFL’s Ian Rapoport. Safe to say he earned it. Falling just behind Martin, four-year veteran Norwell earned career-highs across the board in his contract year with the Panthers, leading to a very lucrative offseason for the former undrafted free agent out of Ohio State. Norwell earned an 88.0 overall grade and a 98.1 pass-blocking efficiency in 2017, eclipsing previous career highs and ranked No. 3 and No. 2, respectively. His efforts this past season, combined with his previous three seasons of quality production, helped him put pen to paper with the Jacksonville Jaguars on a five-year, $66.5 million deal. Stepping in for five-year veteran and former Jaguars starter Patrick Omameh, Norwell serves as an immediate upgrade to Jacksonville’s interior offensive line. Drafted as a first-round pick in 2012, DeCastro had high expectations tied to his name early, as general manager Kevin Colbert went as far as to say DeCastro was one of 7-to-10 “sure-fire” NFL players shortly after the selection. Unfortunately for DeCastro and Colbert, a severe ankle and knee injury limited him to just 138 snaps as a rookie and slowed his development significantly. Now, 5,803 offensive snaps and five years later, DeCastro has proved to be quite the “sure-fire” selection for the Steelers. In 2017, DeCastro recorded career highs in overall grade (91.7) and pass-blocking efficiency (98.1), allowing just 16 total pressures (14 hurries, two hits) in the process. He only allowed multiple pressures in four games last season, a testament to his consistency. Boling, though he finished the season at left tackle due to injuries, has been best suited for the guard position, as evidenced by his 98.0 pass-blocking efficiency across his 474 pass-block snaps at left guard in 2017. A fourth-round pick in 2011, Boling has played at least 788 offensive snaps in each of his past six seasons with Cincinnati, earning 73.0-plus grades in all of them. His 2017 campaign, however, was easily his best in terms of pass protection as it was the first time he had eclipsed a pass-blocking efficiency above 97.3 in his career. What he lacked in run-blocking, five-year veteran Senio Kelemete made up for in pass protection in 2017. In his career-high 314 pass-blocking snaps at guard with the New Orleans Saints last season, Kelemete allowed just eight total pressures (five hurries, two hits, one sack), which was good for a 98.0 pass-blocking efficiency. While he also earned a 38.5 run-block grade, Kelemete proved his worth on passing downs, so much so that he received a three-year, $12 million contract and likely a starting job from the Texans this offseason. Replacing the Texans’ former second-round pick Xavier Su’a-Filo, Kelemete steps in as an upgrade for a Houston offensive line in desperate need for any level of improvement after an abysmal 2017 campaign. The Texans’ offensive line allowed 253 pressures last season, 36 more than any other NFL team. 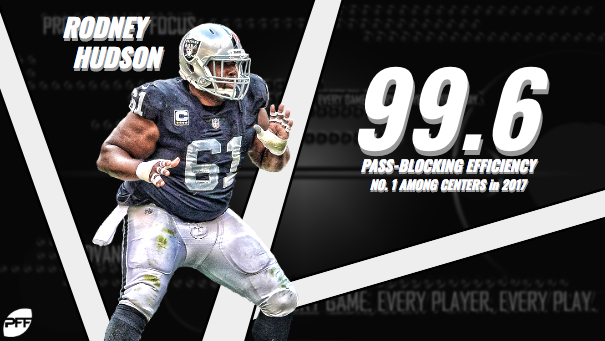 Hudson has quickly blossomed into one of the league’s best at the position since joining the Silver & Black in 2015, as he’s proved leaps and bounds ahead of other NFL centers specifically in pass protection. Since 2015, Hudson has allowed a pressure just once out of every 85.5 pass-block snaps on average, ranking No. 1 among centers with at least 1,000 pass-block snaps in the three-year span. Most recently, Hudson allowed just three total pressures across 592 pass-blocking snaps to earn the top-ranked pass-blocking efficiency among qualifying centers. The 28-year-old Hudson was an undervalued piece to the Raiders’ resurgence in 2016 and continued to perform at an elite level through the team’s woes this past season. Every year he’s been healthy, Linder has performed at a high level, earning 83.8-plus grades in each of the three years he’s played north of 200 offensive snaps. He turned consistency into elite play in his second year as a full-time center in 2017, as he recorded a career-high 99.3 pass-blocking efficiency across 444 pass-blocking snaps during the regular season. With aforementioned Norwell added to the mix and former third-round pick A.J. Cann returning for his fourth season, Linder will reclaim his starting position at center and look to build on a strong 2017 season. After coming off the board in the seventh round in the 2011 NFL Draft, Person has bounced around the league with very little to show for his journey, as he played just 69 total offensive snaps in his first four years in the league (2011-14). However, he was given the opportunity to start at center for the Indianapolis Colts in place for the injured Ryan Kelly in 2017, and he made the most of the opportunity. Person allowed just three total pressures (three hurries) in 194 pass-blocking snaps at center in 2017, good for the third-highest pass-blocking efficiency among centers with at least 150 pass-block snaps. Onto the next opportunity, Person signed a one-year, $915K deal with the 49ers this offseason to back up center Weston Richburg and guards Laken Tomlinson and Joshua Garnett. While it isn’t a glorified role, Person adds value as a key depth player for the 49ers entering the 2018 season. A 2014 second-round pick, Britt has been kicked inside to center due to underwhelming performances at right tackle and guard in his first two years in the league. Fortunately for Britt, he has seemingly hit his stride manning the huddle at center for the Seattle Seahawks. After recording a 98.3 pass-blocking efficiency in his first year at the position (2016), Britt improved his mark by 0.4 points to rank tied for fourth among qualifying centers in pass-blocking efficiency in 2017. He allowed just 11 total pressures (nine hurries, one hit, one sack) in his 651 snaps in pass protection. Having signed a three-year contract extension in August of last year, Britt will remain Seattle’s starting center into 2018 and likely through 2020 if he continues to trend in the right direction. After playing just 82 offensive snaps as a rookie undrafted free agent, Jones replaced injured starter Weston Richburg four games into his sophomore campaign and never looked back. Jones allowed just 10 total pressures (five hurries, one hit, two sacks) in his 488 pass-blocking snaps in 2017, ranking tied for fourth in pass-blocking efficiency (98.7) and second in pass-blocking grade (83.2). He allowed multiple pressures in just one of his 12 starts at center.